Fresh From the Farm by Susie Middleton is a wonderful cookbook filled with excellent recipes. It is full of dishes with fresh and simple ingredients that when combined become complex and full of flavor. It has beautiful photographs and Susie takes you on her journey of farming and starting a farm stand. They say a cookbook is worth buying if it has three recipes that you love. Well, my family has tried only three so far and it is a keeper! This book is, by nature, packed full of healthy, delicious and colorful recipes that are tasty and appealing to the eye. The recipes are easy to follow and there are helpful cooking tips throughout the book. The dishes incorporate flavors that compliment each other and bring out the natural flavors of fresh ingredients that are available year round. I was very excited to review this book. It came just in time for my 15 year old daughter’s Girl Scout Journey, “Sow What”, that teaches young adults about women in agriculture. One of the tasks for her journey was to make a dish from local ingredients to share with the rest of her troop. My daughter chose to make Grilled Roasted Fingerlings with Rosemary, Lemon, Sea Salt and Fresh Corn Vinaigrette. 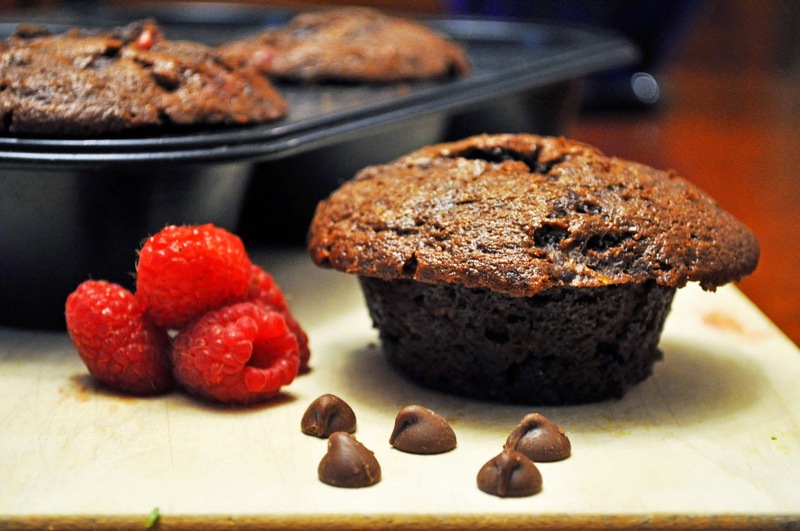 She also made the Chocolate Chocolate-Chip Zucchini and Raspberry Muffins. 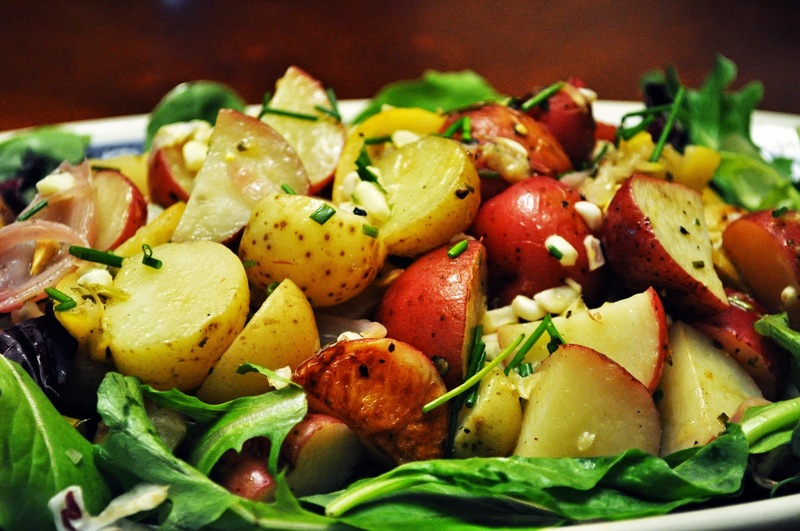 The potatoes were delicious. We especially loved the corn vinaigrette. The muffins were so moist and the troop left no crumbs. I chose to make Southwestern Quinoa Salad with Black Beans and Farm Stand Veggies, a tasty blend of vegetables and quinoa. It makes a lot, so it is perfect to take to a party. I love the way she toasts the spices and quinoa a bit before cooking it. It really brings out the nutty flavor of the quinoa. I only subbed a couple of spices and I used red wine vinegar instead of orange juice. I also added some sliced black olives. You cannot go wrong with this book. In a medium saucepan, heat one tablespoon of the olive oil. Stir in a pinch of salt, cumin, coriander, chili powder and oregano. Toast the spices for about one minute. Stir in the quinoa and coat with the oil and spices. Pour in two cups of water and bring quinoa and spices to a boil. Cover and reduce heat to a simmer. Simmer 20 minutes until all water is absorbed. Remove from heat and let cool to room temperature. 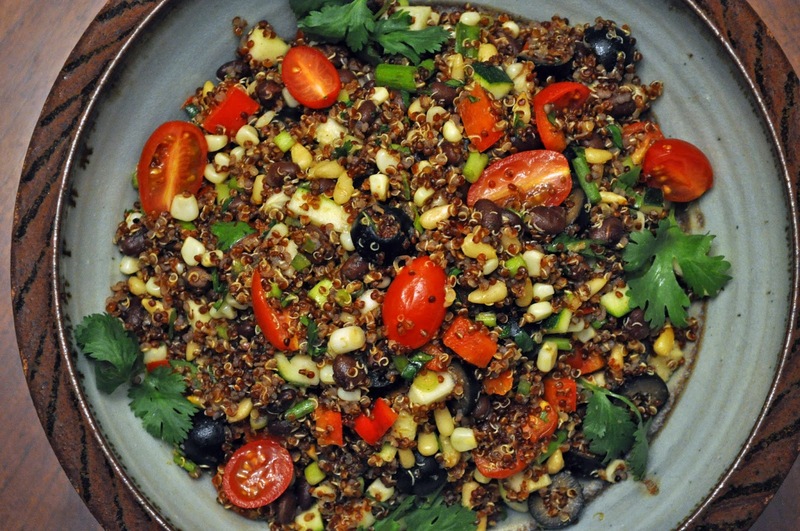 When quinoa is cool, combine cooked quinoa, black beans, zucchini, tomatoes, corn, bell pepper, black olives, scallions and cilantro together in a large bowl. In a small bowl whisk together, the remaining 3 Tablespoons olive oil, vinegar, lime juice, garlic, honey and chili paste. Pour over the quinoa and vegetables, mix well. Toss in the pine nuts and serve.